The Town of Stoneham is taking a proactive approach to planning for the future of its community by creating a Housing Production Plan. 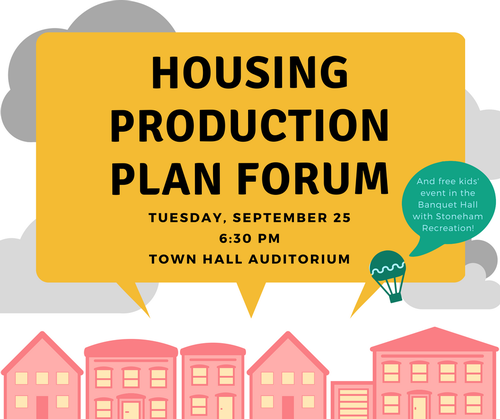 Join Stoneham’s Director of Planning & Community Development, Erin Wortman for a public forum, where information about the town’s current demographics, housing supply, and the Housing Production Plan process will be discussed. The purpose of the forum is to learn about residents’ housing priorities for Stoneham, the location of new housing, and housing goals for the next five years. This event is kid-friendly and activities will be provided by Stoneham Rec at no cost to participants. Stoneham Town Hall Auditorium, 35 Central Street, Stoneham.